The cast of TinkerQuarry. As noted on the game's main page, the story isn't complete yet, so all information is subject to change. Expect unmarked spoilers. There are four types of toys found in the Dollhouse. 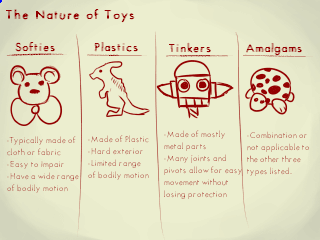 The toys label themselves based on what material they're made of rather than what real species they resemble. The Dollhouse term for plush toys. Everything's Better with Plushies: Especially living ones who are (mostly) on your side. Fragile Speedster: Their soft bodies mean they can move quickly, but are damaged more easily. The Dollhouse term for plastic toys. Mighty Glacier: For the most part, they're slow, but very durable. The Dollhouse term for mechanical toys. Lightning Bruiser: They are stated to be tough, yet quick. The Dollhouse term for any toy who does not fit into one of the above categories, or has elements of two or more of them. Cartoon Creature: In toy species terms, at least, although they often count as this trope in our terms too. 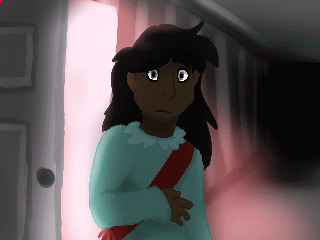 The player character, a little girl who inexplicably wakes up in the Dollhouse. The player names her, although Peter insists that her real name is Adeline. Badass Normal: The toys have "Essences", which give them purpose and power. The girl, being a human, does not have an essence, but is nonetheless just as capable a fighter as they are. Blue Is Heroic: She's the protagonist, and she wears a bright blue dress. 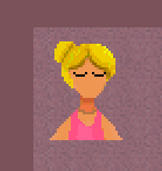 Hello, [Insert Name Here]: The player is able to name her. While most toys call her by the player's name, Peter insists that it's not her real name. Identity Amnesia: As the other toys find out, she has no memory of who she is. Kids Are Cruel: The toys imply that she was cruel to them in the past, but view her Identity Amnesia as a chance for her to start over. Kid Hero: A child who serves as the main protagonist. Silent Protagonist: Has no dialogue, not even grunts or screams. The Smurfette Principle: The only female member of the party so far. Token Human: As far as we know, she's the only human in the Dollhouse. "This place is not safe for you. We need to get you out of here before Staya suspects anything." A Softie rabbit, and the first toy to join the party. He has the Essence of Hope. 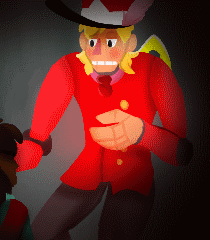 The Big Guy: When the protagonist meets him, he is shown to be quite big, but he shrinks down when he joins the party so she can carry him in her Magic Parcel. Not long after meeting him, he also pushes a dresser in the middle of a hallway out of the way. Blue Is Heroic: Wears light blue clothing. Casual Danger Dialogue: He is the one to deliver the battle tutorial, which he does the first time he and Adeline encounter an enemy. He gets so wrapped up in calmly explaining how battle works that the enemy catches him off guard and attacks him... and even then, he's not very worried about it. Deadpan Snarker: He sometimes makes biting remarks, usually directed at other toys. Handicapped Badass: Although his legs have been torn off, he is still very powerful. 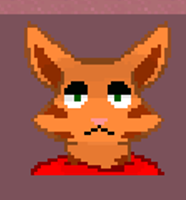 Purple Eyes: Most obvious on his dialogue sprite. They give him something of a mystical appearance. Righteous Rabbit: A plush rabbit, and the first character to help the protagonist. The Stoic: Unlike the other toys, he constantly acts gloomy, or bitter, or something. It's hard to tell what he's feeling, as he's a very enigmatic character. Whiskers is a Softie cat, and Skid is a Plastic spider. They are best friends who run Havenquarter, a safe place from Staya and the other enemies. You must choose one of them to join your party, while the other stays behind in Havenquarter. Whiskers has the Essence of Risk, and Skid has the Essence of Adventure. Amazing Technicolor Wildlife: Pink and red are not typical colors for a cat and spider respectively. Justified in that they're toys. Beware the Nice Ones: They are two of the kindest characters in the game, but they won't hold back when fighting enemies. They get especially scary if you take Sera's Essence after beating her. Not only do they attack you, they're both rather eager to finish you off. Break the Cutie: This is what happens when you take Sera's Essence. First they are horrified and enraged, and attack you. Then, after you literally beat them half to death, they are both shocked almost to the point of being speechless. Peter tries to tell them that taking Essences is necessary to help save the Dollhouse, but Skid and Whiskers can't bring themselves to agree. Whiskers snatches Sera's Essence from you, and he and Skid run away, traumatized. Dual Boss: You must fight them both at the same time if you take Sera's Essence. Nice Guy: Both are very friendly and polite. Plucky Comic Relief: They're both much more cheerful and comical than the other characters in the party. The Pollyanna: They are both shown to be eternally optimistic. One of the questions you can ask them is "Was I a bad person?" to which they both say no, but it seems that they're not just trying to make you feel better, they really do believe this. Power Trio: They used to be on a team with Sera, but she ran off at some point. Still, they keep their hopes up that she'll "come home" soon. Red Oni, Blue Oni: Skid is more energetic and naive, while Whiskers is more laid back. Those Two Guys: Although they become separated once you choose one to join your party. Wide-Eyed Idealist: Both of them firmly believe that everything will be okay, despite the generally dismal state of things. Cheshire Cat Grin: He has a very wide grin, and although he appears intimidating at first, this trope is quickly averted, as he turns out to be a Nice Guy. Cute Kitten: Although he resembles an adult cat, he is very sweet and friendly. Expy: With his laid back personality and wide grin, he seems to be based on the Cheshire Cat. With his pink fur, he especially looks like Disney's take on the character. Funetik Aksent: Judging by his "ya"s and other inflections, he seems to have a Southern accent. The Gambler: Invoked. His Essence of Risk looks like a die. Nice Hat: A bright red hat adorned with feathers. Real Men Wear Pink: Not only is he literally colored pink, he also wears a stylish hat with colorful feathers, and acts quite gentle with his friends. He's still totally capable of fighting, though. Cheerful Child: He has shades of this, although the toys technically don't have ages. Friendly Neighborhood Spider: A friendly, childlike spider who is one of the sweetest characters in the game. Red Is Heroic: A friendly little guy, and he's colored red. Somewhere, an Entomologist Is Crying: Although he appears to be a spider, he only has six legs. Justified because he's just a toy. "It is good to see that you are well. My name is Clint. Surely, you remember me?" A Tinker resembling a nutcracker. At first, the player only knows him from the notes he left around the Dollhouse, giving information on certain topics. After meeting him deactivated in one room, we later learn that he was friends with Skid and Whiskers, who tell us more about him. After that, he can be brought back to life and join the party. He has the Essence of Willpower. Badass Bookworm: He's not just a powerful soldier, he's a powerful soldier who writes notes and conducts research on various phenomena in the Dollhouse. Big Good: He used to be a kindly caretaker for the Dollhouse, but he seems to have disappeared around the time Staya entered the Dollhouse and took it over. Chekhov's Gunman: We see him early on in one room, but he's missing his windup key, and can't move or speak. Later, the player finds his windup key. Bringing it to him will bring him back to life and allow him to join the party. Exposition Fairy: His notes provide information on the world of the Dollhouse, as well as hints on its backstory. Reading the notes with him in the party will have him reveal even more context. Expy: To The Nutcracker, being a heroic toy soldier who keeps others safe from monsters, including evil mice. Red Is Heroic: He wears a red soldier's uniform. "Beware of dog" has never rung so true. "GO BACK TO YOUR ROOMS." A doglike toy who wants to keep everyone in the Dollhouse. 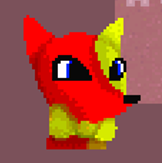 He is referred to as Staya for most of the game, but it is hinted that his real name is Fido the Jumping Dog. He also serves as the first boss, then returns later as the fourth boss. He has the Essence of Loyalty. Angry Guard Dog: Although, unlike most examples of this trope, his job is to keep people in rather than out, he fits the "angry dog" part very well. Big Bad: He is the main obstacle keeping Adeline from leaving the Dollhouse, and the one mainly responsible for turning it into such a nightmarish place. Body Horror: His neck and limbs are springs, and he has a clock inside his mouth, giving him a very unsettling appearance. We later learn from Clint that he used to have fur, but it was torn out, and that the clock was shoved into his mouth. Clocks of Control: He's a mechanical toy whose body is covered with clocks. He is also the merciless dictator of the Dollhouse, who forces everyone to stay in their rooms under the threat of being violently attacked. Control Freak: He is obsessed with making sure no one leaves the Dollhouse. This obsession with keeping order ties in nicely to his clock motif. The Dreaded: Due to his violent nature and iron-fisted rule over the Dollhouse, most toys are terrified of him. Evil Virtues: Although he goes crazy keeping everyone in the house, he does it out of love and respect for his owner, and hope that she will come back. It's rather telling that his Essence is Loyalty, rather than something like Cruelty. Fluffy the Terrible: His real name, Fido, is hardly intimidating, although barely anyone calls him that anymore. 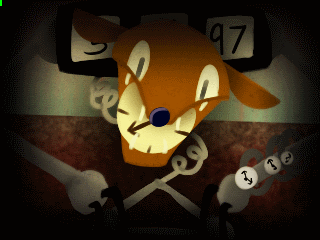 Flunky Boss: The second time he is fought, he has a couple rats accompanying him. They stay in front of Staya, and you must defeat them along with him. Ineffectual Sympathetic Villain: In JingleQuarry, where the other toys "banished" him to the room upstairs because he was on bad behavior. He is not amused. You've gotta feel bad for him, despite how terrifying he is in the base game. Knight of Cerebus: Staya is equal parts scary and tragic, but there is almost nothing funny about him. He doesn't get that much screentime, but given how terrified the other toys are of him, they talk about him a lot, during which the mood always darkens. Large Ham: ALL OF HIS DIALOGUE IS WRITTEN IN CAPS LOCK. Only Known by Their Nickname: His real name, Fido, is used very infrequently. More often, he goes by "Staya" or occasionally "The Dog." Pest Controller: He is shown to be able to control the rats. 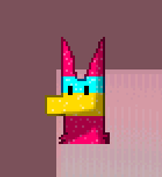 Punny Name: His name is short for "Stay a while", the game's Arc Words. Tragic Villain: Implied. It is stated that in the end, he's "just a lost dog". 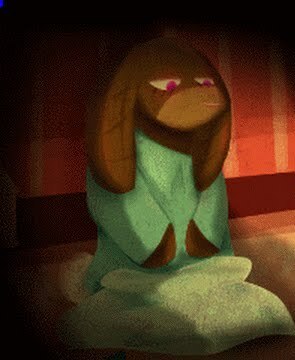 Clint tells us that Staya's body was horribly mutilated at some point, and that the reason he wants all the toys to stay with him is so they can wait for their owner to come back. Visual Pun: Being a toy dog with clock parts, you could say he's a watchdog. Yandere: A non-romantic variation. He forces everyone to stay in the Dollhouse because he wants everything to be perfect for when Adeline comes there. When she beats him in a fight, he realizes that she doesn't want to stay, but simply believes that she is mistaken. When Adeline meets Staya again later on, he drops all the formalities and goes all-out and attacks her. Word of God states that he's trying to destroy her friends and capture her, even if it means Impairing her, so he can keep her forever. "I was just trying to get away... I didn't want him to hurt me like- ..."
A Softie dragon who Adeline and Peter meet on the roof. 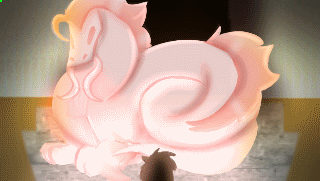 She is very wary of them, and she panics and attacks them, becoming the game's second boss. She has the Essence of Fear. Accidental Murder: As revealed in Clint's journal, she accidentally knocked Abigail off the roof of the Dollhouse. Disney Villain Death: Played with. After beating her in battle, she stumbles backwards and falls off the roof, although Peter makes it clear that she isn't dead, but "impaired", or unconscious. Glowing Eyes of Doom: Her eyes glow a soft white. Ironic Death: Not necessarily "death" because toys can't be killed for good, but after her boss battle, she falls off the Dollhouse, and as we learn later, she pushed Abigail off the roof too. It's a very tragic case, though, as Sera didn't mean to do that. Knight Templar: Granted, it could just because she's too stressed out to think clearly, but she attacks Adeline and Peter because she believes they are evil. "I will not let you imprison my friends!" Our Dragons Are Different: Resembles a Western dragon, and has the destructive personality of one, although she's less evil and more paranoid and quick-tempered. Large Ham: Like Staya, she shouts most of her dialogue. Justified in that she seems to be terrified in the scene where she appears. My Nayme Is: While Sera is already a rather non-typical name, her name was spelled Cera in earlier versions. 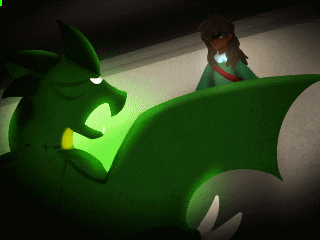 Sickly Green Glow: Her Essence of Fear looks like a green, glowing crying face. Tragic Villain: Although she attacks the player seemingly unprovoked, she is clearly paranoid and traumatized about something that happened in the past. Wings Do Nothing: Despite having wings, she still falls off the roof of the Dollhouse. Be, believe, belong! Be, believe, belong! Leave the circle never, weave the quilt forever! "Being a Barista can be so boring, honey... It's hard to get creative around here with only mugs and beans." A creepy Plastic bat who runs a coffee shop. She soon reveals that she also makes designer clothing... out of materials from impaired toys. She attacks the player for turning her down. She is the third boss on the good route, and the fourth on the bad route. She has the Essence of Beauty. Bat Out of Hell: A downright creepy-looking bat who is clearly insane and violent. Evil Albino: She's all white, with glassy eyes. Evil Old Folks: Aside from her pale, shriveled appearance, she also has some of the mannerisms of a Granny Classic, such as calling people "dearie". In reality, she's anything but sweet. Human Resources: She makes coffee and clothing from the parts of impaired toys. Nightmare Fuel Station Attendant: She seems very proud of her creations, despite the other characters' understandably horrified reactions. Shout-Out: Earlier in development, her name was Stellaluna, after a popular children's book about a bat. In-game, her name is a shortened version of this. Skippable Boss: It is entirely possible to just walk right by her shop and complete the current version of the game without ever meeting her. 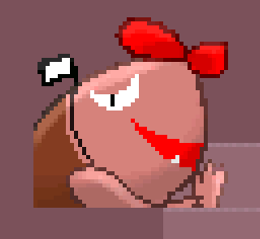 Soft-Spoken Sadist: Unlike the other two boss characters, she never raises her voice, yet she's perhaps the most disturbing out of all of them. I'm the giant rat that makes all of the rules! An enormous three-headed rat that attacks you in Clint's study. Evil Albino: It's white with red eyes. Hellish Pupils: It has snakelike pupils that give it a demonic appearance. King Mook: The biggest, scariest, and most dangerous of the rats, and it actually wears crowns upon its heads. Large and in Charge: It's much bigger than the other rats, and it is apparently their leader. Multiple Head Case: A three-headed monster rat. 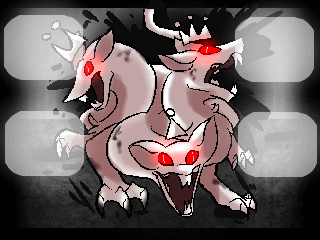 Rat King: A three-headed rat (or possibly three rats fused together) that rules over the other rats. Red Eyes, Take Warning: This beast has glowing red eyes. Silent Antagonist: Like the other rats, it does not speak. The most common enemies encountered in the Dollhouse. Animalistic Abomination: Word of God says that they are neither toys nor actual rats, but what they really are is still unknown. Dark Is Evil: They're all dark in color, and tend to pour in from dark holes in the walls. Eek, a Mouse!! : The smaller mouse enemies are seen as annoying pests. Elite Mook: There are bigger rats which are more powerful, and have a much more menacing appearance. The Goomba: The smaller rats are the first, and weakest, enemies encountered. Mecha-Mook: Tinkerrats, a species of robotic mouse enemies. Red Eyes, Take Warning: Most, if not all of these evil vermin have red eyes. Swarm of Rats: Downplayed. Although they are everywhere, they don't team up to fight you except for the ones who accompany Staya the second time he fights you. You Dirty Rat! : A bunch of evil rats and mice. Less common enemies, these toys have the same nondescript Essences as the rats, and seem to be unthinking. Black Bead Eyes: Lesser Softies have these. Killer Teddy Bear: The Lesser Softies are all teddy bears. Inexplicably Identical Individuals: Each Lesser toy looks exactly the same as the others of its type. Tin-Can Robot: Lesser Tinkers resemble cartoonish robots. "You're always welcome to listen to my music!" A friendly, if somewhat mischievous, toy ballerina who lives in a music box and provides save points. Exposition Fairy: If asked, she can provide the player with hints on what to do next. Eyes Always Shut: Giving her a relaxed appearance befitting her carefree personality. Leitmotif: A beautiful music box tune. Justified in her case. Since she lives inside the music box, and you talk to her by opening it, it only makes sense for the song to play whenever you talk to her. No Mouth: Probably justified, as you wouldn't expect a tiny figurine to have the most detailed of faces. Nostalgic Music Box: She lives in one, and plays its sweet music every time you meet her. Offscreen Teleportation: She somehow moves her music box to different rooms in a short time. When Peter lampshades this and asks how she does it, she tells him that she simply walked there. Shout-Out: Fittingly for a ballerina, she's named after the princess from Swan Lake. A big, dinosaur-like toy seen sleeping in the kitchen. Although not much is known about him currently, Peter tells us that Frutti can be temperamental and destructive when awakened. 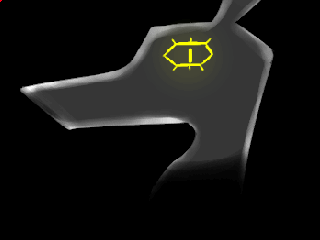 Black Bead Eyes: As seen in promotional art. Gentle Giant: He's definitely large, and he sure seems docile while sleeping, but according to Peter, he's anything but when he's awake. Time will tell whether this is true or not. Hair-Trigger Temper: Apparently, he reacts violently to being woken up. Hidden Depths: All we see is a big lug of a dinosaur, but he's apparently also a decent chef who wrote his own cookbook. Informed Flaw: Peter tells us that he's "excitable" when awake. We haven't seen him act this way yet. "Oh dear, oh my... are you hurting, friends? I can fix you up, totally!" A piñata who pops up in various places around the Dollhouse (although he does have his own shop in the Residence Halls). For 150 Teeth, he refills the Condition and SP of everyone in your party. Afraid of Blood: Implied. Once paid, he is glad to heal you, mentioning that your cuts made him nervous. Black Bead Eyes: To compliment his cute appearance. The Medic: Among the NPCs, that is. He heals the party rather than selling things. Nice Guy: One of the friendliest characters in the game. He provides helpful and convenient services for a reasonable price. "I carry the Essence of Courage. I'm not afraid to use it." An Amalgam whose bedroom Adeline and Peter wind up in while crawling through the vents. She panics and runs away, prompting Adeline and Peter to track her down. They find her later in Havenquarters and convince her to help them. She has the Essence of Courage. Cartoon Creature: She seems to have features from many different animals. Word of God states that she is supposed to be a cute monster, not like any specific animal. Jerk with a Heart of Gold: She is very wary of Adeline, refusing to believe that Adeline is good now, but considering the horrible state of the Dollhouse, you can't blame her for being worried. She also does agree to help Adeline and Peter open a locked door to progress. Lovable Coward: In her first appearance, we barely get to see her before she runs away from Adeline. She's also wary about climbing through one of the dark holes in the walls to help the party. When Peter points out that this behavior is ironic considering that her Essence is Courage, she responds with "There's a thin line between Courage and stupidity, rabbit." Trail of Bread Crumbs: Peter notes that everywhere she goes, the red hairs on her neck ruff fall out. When she runs away, she leaves a trail of hairs which Peter and Adeline follow. We Hardly Knew Ye: We don't get to see much of her before she is impaired and left impaled on a stick outside Stella's shop, presumably by Staya. "What brings you to this elevation of our prison?" An enormous glass dragon statue who sits in the room just outside the maze. He has the Essence of Wisdom. And I Must Scream: He notes that since he is a glass sculpture, he cannot move at all. This may be why he asks you to kill him. Death Seeker: Asks you to activate a strange device if you find one. The strange device turns out to be a weight on the roof that crushes and shatters him. Exactly What It Says on the Tin: It's a glass dragon. Our Dragons Are Different: Clearly based on an Eastern dragon, considering his appearance and calm personality, although his appearance also looks somewhat similar to a Western dragon, in terms of body shape. The Stoic: He shows very little emotion when he speaks. Somewhat fitting, considering that due to being unable to move, he can't be physically emotive either. "Halt intruder!" "What is your business here?" A pair of identical Plastic dinosaurs who guard the Lower Residential Halls. They both have the Essence of Obedience. Black Bead Eyes: They both have these, giving them a rather comical look. The Generic Guy: They just work as guards, and have no distinctive traits. Seldom-Seen Species: They are a genus of dinosaur called Hadrosaurus. Single-Minded Twins: They look identical, have identical personalities, and even share the same Essence between them. Sycophantic Servant: They completely devote themselves to whoever their current boss is, and at the moment, it's a mysterious character known as the Dreamcatcher. Those Two Guys: They work together guarding the entrance of the Lower Residence Halls. 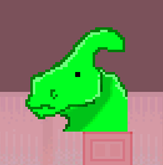 A Plastic dinosaur who is second-in-command to the Dreamcatcher and bosses the Hadrosaur Twins around. Carry a Big Stick: She is always armed with what appears to be a mace, and she certainly looks like she wouldn't hesitate to use it if she had to. Tyrannosaurus rex: She appears to be one. A toy gryphon who you meet walking around outside his room in the Residence Halls. Our Gryphons Are Different: A Living Toy gryphon, no less. Red Eyes, Take Warning: Averted. Despite having red eyes, he seems pretty congenial. Another Softie cat. He is seen in his own room in the Residence Halls, which contains some sort of chamber used to harvest Lesser Softies. Cats Are Snarkers: He's a much less lively guy than Whiskers. 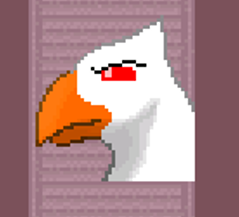 The Stoic: He keeps the same bored expression on his face, even when talking about how he harvests Lesser toys. The Contest Winner Cameo characters for the YCH raffle in July 2017. They all live in their own rooms in the Residence Halls. "Music is supposed to be free! An art of expression!" 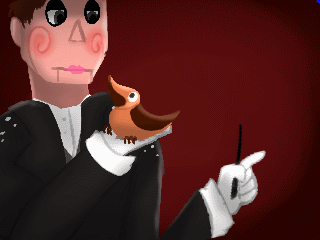 A puppet/dummy who serves as the conductor of an orchestra of mechanical birds. He has the Essence of Harmony. All Gays Love Theater: He's attracted to Clint, and he loves music and theater. According to him, he has put on multiple shows for Clint in the past. Big "OMG! ": Utters one when he meets Clint for what is stated to be the first time in a while. Collection Sidequest: He tasks the player with finding four of his birds, which have wandered off. Demonic Dummy: Averted. Despite resembling a ventriloquist dummy, he isn't the slightest bit evil. Leitmotif: He gets a rather somber theme on piano and strings. Pun: While complaining about his musicians, he says that they sound "TREBLE", before correcting himself to "terrible." May also be a Freudian Slip. Sharp-Dressed Man: He wears a tuxedo, fitting for his job as an orchestra conductor. "Feel free to play a game or two while you're here! I've got a puzzle open!" A Softie poodle dressed like a circus clown. She invites you to solve the puzzles she set up and win prizes, such as her trademark cotton candy, which can be equipped in battle to heal you. She has the Essence of Amusement. Dog Stereotype: Downplayed. She is a female poodle who is implied to have a French accent ("Ooh la la! "), but the stereotypes end there. Rather than being spoiled, or vicious, she's more outgoing and friendly. Emoticon: Her door is simply labeled "Carnival! :)"
Fun Personified: She filled her room with circus objects, and she cheerfully invites the player to try out the minigames she set up. It's even implied that she has no idea of the darker things going on in the Dollhouse, and just wants you to have fun with her games. Gag Nose: Being a clown, she has the traditional round red nose. Graceful Ladies Like Purple: She's a sweet girl who wears a purple hat, gloves, and shoes. Even her fur is a bluish purple. Innocent Blue Eyes: She has bright blue sclerae and dark blue pupils, and she is quite sweet and friendly. Leitmotif: She gets an upbeat techno tune called "Bounce". Nice Hat: She wears a purple, cone-shaped hat with red pom-pom buttons. 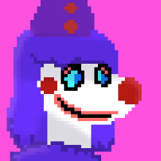 Non-Ironic Clown: A cheerful, fun-loving clown poodle who lives in a circus-themed room and sets up minigames and puzzles for the player. Punny Name: Her name is a portmanteau of "canine" and "mime". Wrong Genre Savvy: She is implied to be rather blissfully ignorant of the horrors going on in the Dollhouse. The user who created her for the contest says that this is because "she thinks she's in a more kid-friendly game." "Indulge me with a few riddles? I'll make it worth your while." A large statue resembling the Egyptian god Anubis. He gives you a key to another door in the Residence Halls if you can solve his riddles. He has the Essence of Mischief. Cheshire Cat Grin: Subverted. 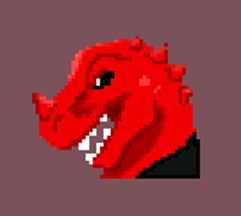 He has a wide, toothy grin on his overworld sprite, but he's actually pretty nice. Dark Is Not Evil: Although he appears intimidating at first, thanks in no small part to his dark, somewhat sinister appearance, he soon turns out to be benevolent. Endless Corridor: He lives in an endless storage room that keeps looping around. Leitmotif: Fittingly for an Ancient-Egyptian-themed character, his theme is "Mystery Bazaar," a Middle Eastern-sounding piece by Kevin MacLeod. No Mouth: His big grin suddenly disappears when he is asking you his riddles. Pop Quiz: His riddles are actually based on characters you meet earlier in the game (including Tenor and Camime). Shout-Out: He is modeled after the Egyptian god Anubis. Sophisticated as Hell: He uses a lot of fancy words, but his last line is "Toodles!" Supernatural Gold Eyes: A mystical character with bright yellowish eyes. Tom the Dark Lord: Downplayed. While he's not evil, "Charles" certainly isn't the name you'd expect a big, dark, imposing, living statue to have. Not to mention that it doesn't fit his Egyptian theme. "Business hasn't been going well for a while... with everyone being forced to stay in their rooms and all. I still have a few fresh supplies, though, if you can pay for them!" 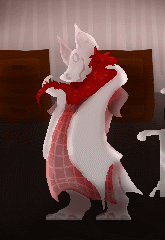 A Plastic fox who runs Walter's Shop for Troubled Toys, and the first shopkeeper you meet in the game. e has the Essence of Generosity. Jerk with a Heart of Gold: Although he is rather touchy at times, he's still an honest businessman who is pleased to sell you items. Nervous Wreck: Although he's willing to do business with you, he's terrified of Staya and the thought of him catching you in his shop. Oh, Crap! : When you crawl through the vents, you can get behind the counter at his shop. If you do this and talk to him, he panics. In older versions of the game, he actually hits you (though it doesn't cause any damage), but in newer versions, he just gets shocked and tells you to leave. "Care to help yourself to the stock? Far better than Walter's trash heap, I'm sure." A toy hobby horse who runs his own shop near Stella's shop. 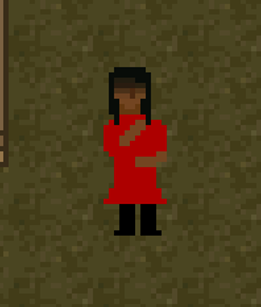 The second shopkeeper in the game. Word of God says he has the Essence of Greed. Black Market: Implied. Instead of having a proper store setup like Walter or Ire, he seems to have just a stand. His seedy behavior doesn't help. 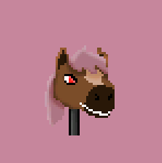 Hellish Horse: A living hobby horse with a sinister grin and red eyes, who owns a Black Market, evil cockroaches, and is conspiring with the Ax-Crazy Staya. Hidden Depths: Behind his mean exterior, Wilson seems to actually be pretty insecure. For one thing, he's terrified of Clint, and as it turns out, he actually has a crush on Stella, but is too shy to tell her. Jerkass: He acts much ruder than the other shopkeepers. Pest Controller: The enemy Creepy Cockroaches in the room next to his shop are, according to a sign, his pets. 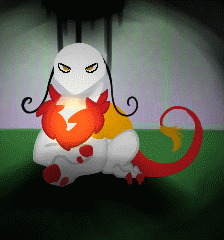 Red Eyes, Take Warning: One of the most overtly cruel characters in the game, and he has red pupils. Token Evil Teammate: Not only is he the only evil shopkeeper, he seems to be the only toy whose Essence is named after an explicitly evil qualitynote Even Sera's Essence, Fear, can be seen as sympathetic considering that she's the one who's afraid. Despite all this, though, he's not so bad deep down. A friendly Plastic airplane who has set up shop in an old toy train engine. Lovable Coward: She is terrified of the rats, and she hides under her desk for protection when no one is around, but she's so sweet that you just have to feel sorry for her. Nice Girl: She is very polite to the party. Sentient Vehicle: A living plastic airplane. A mysterious being who has become the de facto leader and protector of the Residence Halls. All we really know about it is that the Soldiers (and Tenor) look up to it, but Clint is rather angry with it, thinking it replaced him. The Ghost: A few characters have mentioned it, but we have yet to see it. The Omniscient: According to one of the Soldiers, the Dreamcatcher sees all. It's unknown if he was exaggerating or not. All of those little souls in one place. 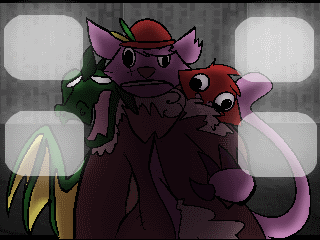 If the former two don't join your party, then Skid, Whiskers, and Sera all get fused together by Staya. This creature was teased a few times by Hallowraith before finally being added to the game. They are encountered if you take Sera's Essence, preventing Whiskers and Skid from joining your party, and then beat Staya and the rats. Staya seems to be ready to give up, but then he sends them to attack you. In this route, they are the 6th boss. Being a fusion of Skid, Whiskers, and Sera, it has all three of their Essences. All Your Powers Combined: They use attacks from all three of the characters that make them up. And I Must Scream: The toys making up this beast are all in color, not grayscale. That means that they're not Impaired. They're fully alive and awake despite the painful state they're in. Body Horror: Even though they're toys, it's still painful to see them stitched together so haphazardly. Silent Antagonist: They seem incapable of speech, which only makes them scarier. 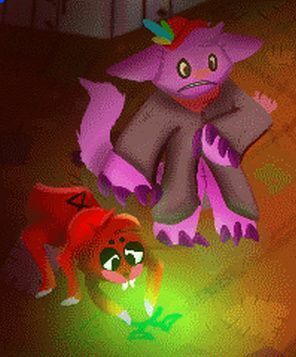 Tragic Villain: Although they attack the player, from the looks on their faces, they don't seem to want to. It doesn't help that all 3 characters making up the creature were established to be very tragic separately. Two Beings, One Body: Three Living Toys that have been fused together. We know very little about them, but it's implied that they had a huge impact on Adeline and her toys. At various points in the story, Adeline has flashbacks that give us brief glimpses of the mother. Abusive Parents: Implied. Though we don't know what they did to Adeline, the fact that they were apparently heavy drinkers can't be a good sign. The Alcoholic: All but stated outright by Stella, who said that she watched them drinking drinks that had "strange effects" on them. In the flashback scenes, the mother seems to be weakly staggering as she walks, and Word of God confirms that this is because she is drunk. Disappeared Dad: Stella mentions seeing both Adeline's mother and father, but in the flashbacks so far, we only see the mother. If he is gone, he presumably disappeared while Adeline was young. Face Framed in Shadow: In the flashback scenes, the top half of the mother's face is darkened, adding to the mysteries surrounding her character. The Ghost: At first, all we knew about them is what we heard from a few other characters, most notably Stella. Later updates introduced the flashback scenes where we see the mother, although we still don't know what the father looks like.